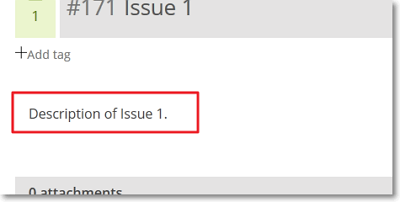 Click the current description of the Issue or, if there is no description, click the designated empty placeholder. Edit the description of the Issue. For help with formatting the description, in the bottom-right side of the editor, click Markdown syntax help. Note: To preview the edited description, next to the save button ( ), click ; to return to the editor and continue editing the description, click or, to save the description, click .